It's four years since the first Nike+ FuelBand went on sale in the US. Despite leaving this mortal coil so soon (two versions, three years) the FuelBand fitness tracker was undoubtedly a pioneer. And while the wristband won't be remembered as a sales juggernaut, its importance as a transformative product can't be understated. Essential reading: How does a fitness tracker work? It might have launched after the first ever Fitbit, but this was the fitness tracker that got people comparing Fuel Points, even though no one ever really knew what Nike's metric meant or how it was calculated. Yet it was exciting. While every device reports back on your activity, this was the first time we'd experienced that insight. It felt personal, refreshing… revolutionary. Yet it wasn't even close to perfect. You could sit at your desk waving your hand to ramp up your score and that built-in micro USB charging port felt like the genius moment from Nike until it stopped working and you had to get replacement after replacement. While the original Jawbone UP was quietly snaring tech enthusiasts embracing a new era of the quantified self, Nike was putting a globally recognisable face on the movement. Rather than Jawbone's identikit fitness models, the FuelBand had LeBron James in commercials and Serena Williams wearing the product on court. That did more to raise the profile of fitness trackers than any of the others combined. 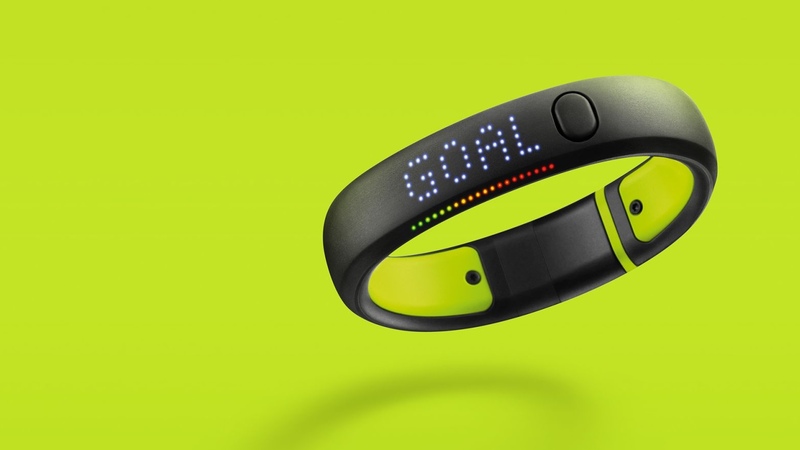 Beyond the hype, the Nike FuelBand was a solid, well-conceived first generation product, while the underpinning concept of Nike Fuel – a brand new currency for the exercise tracking – helped to change the game for the better. In the early days, trackers were essentially pedometers on a rubber band. If you weren't stepping it, you weren't getting credit for it (at least without inputting the data yourself). The FuelBand allowed you to accrue fuel for movement as well as steps. Other activities like yoga, weightlifting, cycling and cross training too could be quickly calibrated, albeit with varying degrees of success. Heck, even if you were rolling out pastry, or curling your bicep to facilitate the secure transportation of beer into your mouth, you were racking up the Nike Fuel. Coloured LED lights represented progress towards simple, incentive-based targets without the need to mess with or open up your iPhone app. Need to complete your goal a few minutes before bed? Just take the dog for a walk or do a few sit-ups. It wasn't perfect, but the FuelBand seemed primed for greatness, with just a little tinkering plus the addition of some new features and the then-missing support for Android. The follow up Nike FuelBand SE, released in late 2013, added Bluetooth 4.0 for real-time syncing with the iPhone app, better battery life and an attractive colour line up, but it wasn't the leap it needed to be. It wasn't fully waterproofed, thus remaining useless to swimmers, but it did have additional social features. Yay! However, while Nike was treading water, the competition was powering forward. By time the SE rolled around, there were more options out there from the likes of Fitbit, Jawbone and Misfit, geared towards fitness buffs as well as casual users. With its 1.5 release, Nike had shown its unwillingness to go all the way, further evidenced by the continued failure to acknowledge that half of mobile users actually existed. By the time a FuelBand app for Android arrived in July 2014 (two and a half years late), the writing was already on the wall. Nike was jumping off the bandwagon it helped set in motion, making the belated Android support nothing more than a token gesture. Nike launched its running and training apps for Android, so why did it dally for so long on the FuelBand? Was it through some sense of loyalty to Apple, its long-time partner? When tech's capo dei capi Tim Cook – who incidentally sits on Nike's board – was flashing around his personal FuelBand back in 2012 everything looked rosy. I mean, when does that ever happen? In late 2014, it was actually rumoured that Nike was heavily involved in the creation of a new wearable from Apple. Could the Nike+iPod alliance, so successful in those early days, be reignited to spearhead a new breed of wearables? No. In reality, with his early FuelBand-toting Apple's CEO was essentially setting the stage for what was to follow, raising awareness and pushing along the market before the Apple Watch could come along and swallow it. Rather than bringing Nike on board as a partner for the Apple Watch, and perhaps have Nike Fuel as the movement currency, Apple just aped the technology with its daily Move goals and built on it with a heart-rate sensor. When the Apple Watch arrived in April 2015, Nike went back to being a third-party app on an Apple device. Knowing it was coming, Nike just seemed to step out of the way, firing the FuelBand team (some of whom joined Apple) months before the Apple Watch went on sale. In the post-FuelBand era Nike will go back to providing consumer-facing fitness data platforms, and Nike Fuel is available to developers through an API, but the days of the Oregon-based giant building tracking hardware are over for now. Considering Nike did such a good job setting the pace, it's a shame the firm is dropping out now the real race is underway. It seems like such a missed opportunity. It wasn't just the incremental SE update or the lack of Android support, Nike just didn't put the machine behind the FuelBand in the way it could have. It was really the first high profile marriage of consumer tech and fitness, which is now a multi-billion dollar industry. As Adidas, Under Armour, Asics and New Balance make big plays into tech, let's hope Nike hasn't missed an open goal.